Finally free from what seemed like interminable quarantine in Louisiana, Gun Runner put on an impressive display in his first start of the season, leading every step of the way and drawing off for a 5 3/4-length victory in the $500,000 Razorback Handicap (G3) on the Feb. 20 President’s Day card at Oaklawn Park. Sent off as the prohibitive 1-5 favorite in the overmatched field of six, the son of Candy Ride was taken to the front by jockey Florent Geroux while stalked by Blue Tone about 1 1/2 lengths back as they went the opening quarter in :23.18. Gun Runner continued to dominate after a half-mile was completed in a quick :46.88 and the 4-year-old colt had it all his way to the finish, distancing himself from the rest of the field. The final time of 1:40.97 for 1 1/16 miles was just two-fifths of a second off Lost Code’s stakes record. Left in Gun Runner’s wake were Hawaakom and Domain’s Rap as the winner returned $2.40 for a $2 wager. The Razorback marked a delayed seasonal debut for Gun Runner, who was originally scheduled to start in the $12 million Pegasus World Cup Invitational Stakes (G1) Jan. 28 at Gulfstream Park but missed that date due to restrictions placed on horses stabled at Fair Grounds Race Course & Slots as a result of that track’s outbreak of equine herpesvirus Type-1. 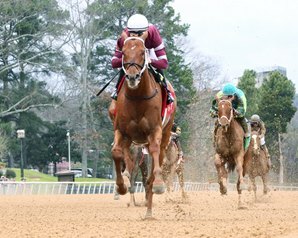 Trained by Hall of Famer Steve Asmussen for Winchell Thoroughbreds and Three Chimneys Farm, Gun Runner improved to 7-2-2 in 13 starts, with earnings of $2,337,800. After winning two grade 2 stakes at Fair Grounds last year, Gun Runner finished third in the Kentucky Derby Presented by Yum! Brands (G1). He subsequently placed in four other graded events, including a third in the Travers Stakes (G1) before closing out the year with an impressive victory in the Clark Handicap (G1). “Last year we learned to let Gun Runner just be Gun Runner and the success has come to him,” Asmussen said following the Razorback. “I’m very thankful to Winchell Thoroughbreds and Three Chimneys for the opportunity to race this horse again this year. With his pedigree and his Grade 1 win last year, it’s very sporting of them to give us another year. Full House was second in the Busher stakes. She was purchased as a yearling on behalf of Joseph V. Shields.